Instructions: The ready side folds card measures 6" by 7 1/2". Choose the paper from the designer paper collection and cut to size measuring 5 1/2" by 7" to create a front panel. Cut a white die cut frame using Intricate Swirl Frames Die and to the window add another paper from the paper collection. Layer the framed window on the card panel with the help of foam tape as shown. For Vellum flowers, color the small area of vellum sheet using distress oxide ink, Seedless Preserves. Stamp the flower images from Floral Fashionista Cling Stamp Set using Versafine clear ink and sprinkle golden heat embossing powder. Dust extras and heat set it using the heating tool. Shape the flowers using needle tool and create few double flowers. Add prills to the flower centers. For roses, stamp the images from classic rose cling stamp set with Magenta Hue and cut them using its coordinating die. Color the rose petals using Rose Maddar and highlight it with Magenta Hue. Shape the flower using deluxe flower shaping kit and add frosting powder. 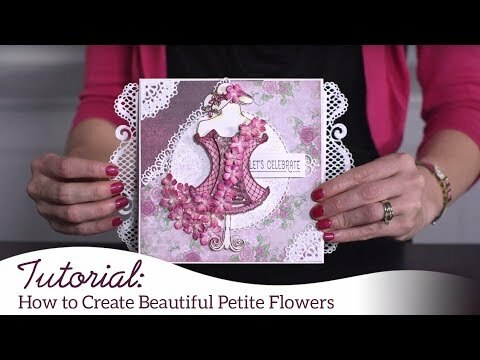 Create 2 medium size flowers. Stamp the images from Elements of Fashion Cling Stamp Set and Floral Corset Cling Stamp Set and Elements of Fashion Cling Stamp Set on white cardstock and paint them using Zig Clear Brush Markers. Stamp 3-4 small floral sprays from Lush Lilac stamp set and cut them using its coordinating die. Color them using Leaf Green and Cactus Flower Archival Ink. Create a sentiment tag using Ornamental Tags Die and cut a small tag from the paper collection. Tie a twine around the card side and tie both the tags on the ends as shown. Stamp another sentiment from Celebrate Love Sentiments Cling Stamp Set on the smallest banner and add it to the right side corner as shown. Once all the elements are ready, assemble the card as shown.